September 30, 2016 – NXT Live Event: Babatunde Aiyegbusi was in a battle royal won by Dan Matha. January 14, 2017 – NXT Live Event: Babatunde Aiyegbusi defeated Chris Atkins. February 17, 2017 – NXT Live Event: Babatunde Aiyegbusi was in a battle royal won by Patrick Clark. March 24, 2017 – NXT Live Event: Babatunde Aiyegbusi defeated Demitrius Bronson. April 28, 2017 – NXT Live Event: Babatunde Aiyegbusi defeated Kona Reeves. April 29, 2017 – NXT Live Event: Babatunde Aiyegbusi defeated Brennan Williams. 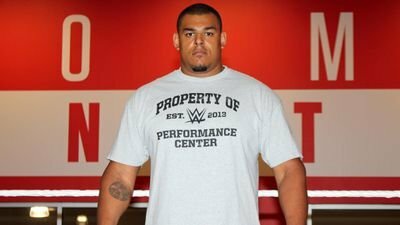 May 11, 2017 – NXT Live Event: Babatunde Aiyegbusi defeated Demitrius Bronson. June 2, 2017 – NXT Live Event: Sawyer Fulton defeated Babatunde Aiyegbusi. June 3, 30, 2017 – NXT Live Event: Babatunde Aiyegbusi defeated Sawyer Fulton. August 4-5, 2017 – NXT Live Event: Babatunde Aiyegbusi defeated Demitrius Bronson. October 5, 13, 2017 – NXT Live Event: Buddy Murphy defeated Babatunde Aiyegbusi. October 20, 2017 – NXT Live Event: Babatunde Aiyegbusi defeated Jeet Rama. October 28, 2017 – NXT Live Event: Buddy Murphy defeated Babatunde Aiyegbusi. December 16, 2017 – NXT Live Event: Babatunde Aiyegbusi defeated Cezar Bononi. February 16, 2018 – NXT Live Event: Babatunde Aiyegbusi defeated Cheng Yuxiang. March 1, 2018 – NXT Live Event: Babatunde Aiyegbusi defeated Wesley Blake by disqualification. March 2, 2018 – NXT Live Event: Babatunde Aiyegbusi defeated Chad Lail. March 3, 2018 – NXT Live Event: Babatunde Aiyegbusi and Brennan Williams defeated Riddick Moss and Tino Sabbatelli. March 30, 2018 – NXT Live Event: Babatunde Aiyegbusi defeated Fabian Aichner. April 27, 2018 – Greatest Royal Rumble: Babatunde Aiyegbusi ended the Royal Rumble match at #37 but was won by Braun Strowman. May 4, 2018 – NXT Live Event: Babatunde Aiyegbusi defeated Chad Lail. May 18, 2018 – NXT Live Event: Babatunde Aiyegbusi defeated Boa. June 2, 2018 – NXT Live Event: Babatunde Aiyegbusi was in the #1 contenders battle royal for the NXT North American title won by Tucker Knight. June 23, 2018 – NXT Live Event: Babatunde Aiyegbusi defeated Fabian Aichner. June 28, 2018 – NXT Live Event: Babatunde Aiyegbusi defeated Rinku Singh. July 12, 2018 – NXT Live Event: The Undisputed ERA (Adam Cole, Kyle O’Reilly and Roderick Strong) defeated Babatunde Aiyegbusi and Street Profits (Angelo Dawkins and Montez Ford). July 14, 2018 – NXT Live Event: Babatunde Aiyegbusi defeated Rocky. July 26, 2018 – NXT Live Event: Babatunde Aiyegbusi defeated Dan Matha. July 27, 2018 – NXT Live Event: Babatunde Aiyegbusi defeated Jaxson Ryker. August 25, 2018 – NXT Live Event: The Velveteen Dream defeated Babatunde Aiyegbusi. September 7, 2018 – NXT Live Event: Babatunde Aiyegbusi defeated Luke Menzies. September 8, 2018 – NXT Live Event: Babatunde Aiyegbusi defeated Rocky. September 22, 2018 – NXT Live Event: Babatunde Aiyegbusi defeated Brennan Williams. September 29, 2018 – NXT Live Event: Babatunde Aiyegbusi defeated Dan Matha. October 5, 2018 – NXT Live Event: Babatunde Aiyegbusi defeated Dan Matha. October 27, 2018 – NXT Live Event: Babatunde Aiyegbusi was in the #1 contenders battle royal for the North American title won by Stacey Ervin Jr..
November 2, 2018 – NXT Live Event: Babatunde Aiyegbusi defeated Dan Matha. December 1, 2018 – NXT Live Event: Babatunde Aiyegbusi defeated Punishment Martinez. December 8, 2018 – NXT Live Event: Babatunde Aiyegbusi defeated Fabian Aichner. February 7-9, 2019 – NXT Live Event: Babatunde defeated Luke Menzies. February 14, 2019 – NXT Live Event: Babatunde Aiyegbusi and Lacey Lane defeated Kona Reeves and Vanessa Borne. February 16, 21, 2019 – NXT Live Event: Matt Riddle defeated Babatunde Aiyegbusi. February 28, 2019 – NXT Live Event: Babatunde Aiyegbusi defeated Denzel Dejournette. March 1, 2019 – NXT Live Event: Babatunde defeated Kona Reeves. March 7, 2019 – NXT Live Event: Matt Riddle defeated Babatunde Aiyegbusi. March 16, 2019 – NXT Live Event: Dominik Dijakovic defeated Babatunde Aiyegbusi. March 22, 2019 – NXT Live Event: Babatunde Aiyegbusi w Court Moore defeated Nick Comoroto. April 12, 2019 – NXT Live Event: Babatunde Aiyegbusi, Jeff Parker and Matt Lee defeated Mansoor Al-Shehail, Rinku Singh and Saurav Gurjar.